We are now agents for Kroll Ontrack data recovery services Australia for more serious data recovery jobs which require a lab based recovery. Are you receiving an error asking you to format the disk from an unrecognized hard drive? This is a classic error indicating a collapsed table or partition. We may be able to recover the partition and therefore recover the data. Diagnostic cost is $49 if you do not wish to proceed after receiving a quote. 1. You can choose the optional "logical recovery" analysis. Your drive may not need to go into the lab if the data can be recovered via the deep layers of the drive. 2. as an agent for ontrack we can help you to get cost free evaluation of the general recoverability of your data before proceeding. Please note recoverability of individual file/folder list requires a fee. 3. We have many years experience covering the full spectrum of data recovery from non-bootable, non-recognized drives, or drives that do not spin up. 4. It costs no more to take advantage of our expertise as a reseller and referral agent for the world leading Kroll Ontrack Data Recovery Specialist Labs. We do not charge a referral fee to the customer. You pay Kroll direct for your recovery invoice. Logical recovery relates to corruption in the firmware layers of the drive. There are many firmware levels to a normal hard drive with various levels of corruption. There is a possibility the data can be recovered, though not high, but it may be worth a proper investigation to the owner given the diagnostic fee is only $49 and determines if the fault is hardware/electrical and a lab should be involved. Does your drive ask to be FORMATTED? Does your drive show up as RAW? It is possible these types of faults can also be rectified to effect data recovery. For other types of recovery, lost files, missing data, accidentally formatted drives etc.,you may only need a Remote Desktop Support session to help yu recover missing data. or local service, please call for further information. 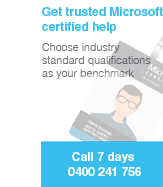 Australia wide data recovery jobs. When sending drives from Western Australia's north west or from interstate please package carefully in antistatic bag and include full contact details. Please do not send drives without prior arrangement. Call Direct (mobile) 0400 241 756 for assistance. We are a small, friendly, successful recovery service based in Perth WA operating since 2005, making us one the oldest established IT service firms in WA. We also RECOVER EMAILS FROM DAMAGED PST FILES FROM OUTLOOK when all other repair options have failed. Don't keep trying to extract data from a damaged PST file as you risk further damage to the file. Send your file to use from anywhere in the world for fast turnaround (3-5 days) and very high recovery success rates using specialised inhouse programs. Recovered data successfully from WD Passport with oxidation and firmware level corruptions issues. 100% recovery. Data Recovery - Does one of these situations describe your problem? You turn on the computer, Windows starts but is not able to access the drive? Your computer starts then reports an error such as NTLDR or CONFIG.SYS MISSING OR DAMAGED, or startup reports BOOT error messages? Your computer keeps restarting in an endless loop? You can see your external hard drive in device management or computer management but cannot open the drive from your PC? You formatted your hard drive but need to recover folders or other data? if your drive is not recognized by Windows it is likely to further damage the drive by repeatedly plugging in and unplugging the drive - do not allow computer shops to open the drive exposing the platter, this will often cause irreversible damage to the platter. Terms & Conditions - whilst every effort is made to protect your data, unstable hard drives and SSD drives often have unknown outcomes during an investigation or recovery. We accept no liability whatsoever for loss of access to your drive or loss of any or all data. Hitachi 2.5" Dell. Inaccessible; clicking and grinding noises. Successfully recovered critical MYOB and Documents folder. Seagate 3.5". Drive does not spin up and appears dead. Recovered 100% of crucial medical related data on this drive. WD 2TB. Burnt electrical board. 100% successful recovery. Western Digital large capacity drive. Data can be seen but not able to copy or move. Repaired drive with 100% recovery. Seagate Barracuda. Drive whirrs but does not proceed to startup. Electrical fault diagnosed. 100% successful recovery. Western Digital 3.5". Clicking, clunking sound. 100% successful recovery. Seagate 2.5". Power related storm issue, damaged electronics. 100% successful recovery.